Le Cheval au Naturel The Natural Horse: Welcome! Welcome to a new adventure, a result of my passion! Thank you for your interest in The Natural Horse, presented by VifArgent Horsemanship! This endeavor is actually a natural extension of the services already offered by VifArgent Horsemanship which simply came into being as a result of my vision and natural approach to horses. This new site, also be a blog, intends to present and promote products, services and ideas to optimize the well-being of equines, while respecting their true nature. It will offer information and solutions to help horse owners meet the mental, emotional and physical needs of their partners, and to promote a healthy and happy equine, based on natural principles. I continue to travel to teach Parelli Natural Horsemanship, which fits in perfectly in a natural approach to the horse. 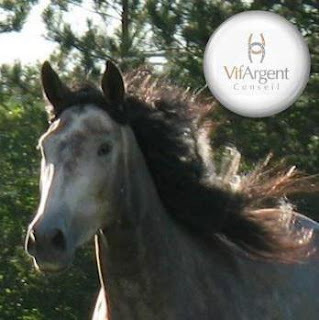 Please check my web site www.vifargent.com for more information on Parelli training. Geneviève Benoit, founder of VifArgent Horsemanship, is a Certified Equine Canada and FEQ Coach, and a Licensed Parelli 3 Star Instructor. She offers conferences and workshops teaching equestrians to optimize their horse's well being, naturally! She also teaches Parelli Natural Horsemanship. For more information on training opportunities, visit www.vifargent.com or click on Education at the top of this page.